AMD has announced a major overhaul of their Catalyst graphics card driver software today, adding new features, improving performance and fixing a large number of bugs. The 'special edition' driver, which is the result of months of work, is one of the biggest AMD has released. 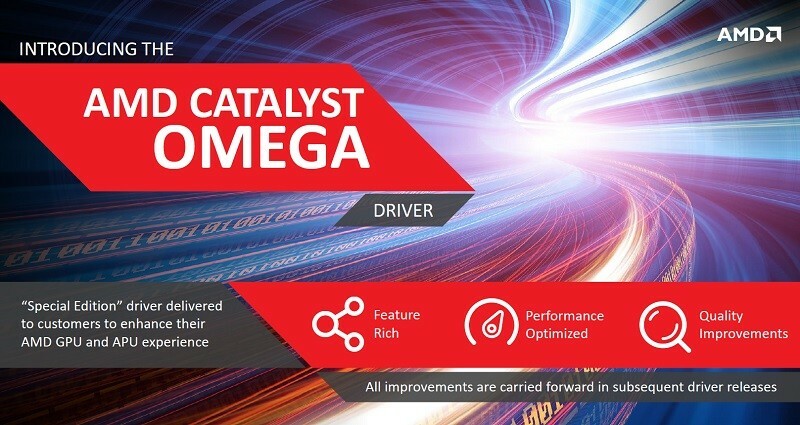 The Catalyst Omega driver boasts some serious performance improvements in many hardware configurations due to a more efficient design. AMD states that you can expect up to 19% more performance than the previous driver (Catalyst 14.11.2) when running games on high-end graphics cards, and up to 29% more performance on APU-based systems. In our own testing, performed by our resident hardware reviewer Steve, we noted significant gains on high-end GPUs in a number of titles including BioShock Infinite and Metro Redux. However in some games, even those in AMD's Gaming Evolved program, there was no performance improvement at all: Watch Dogs, Battlefield 4, Sleeping Dogs, Tomb Raider and Crysis 3 are regularly seen in our hardware benchmarks, and recorded the same performance as the previous driver. Results may vary in different hardware configurations, but it's definitely worth installing Catalyst Omega for the major gains in some titles, even if performance hasn't improved across the board on powerful GPUs. But the driver isn't just about performance: AMD has crammed in over 20 new features, many of which gamers will enjoy. Virtual Super Resolution (VSR) allows gamers to super sample their games, rendering at up to 4K quality before being downscaled to a lower resolution monitor. This form of anti-aliasing is arguably the best, significantly reducing jagged edges while keeping the game sharp. It comes at a high performance cost, though, so it's best suited to older titles unless you have 4K-capable hardware. This type of anti-aliasing isn't new though: Nvidia implemented a version of it, which they named Dynamic Super Resolution, in their 344.11 driver for the GTX 980 and GTX 970 back in September. It's also been available in some games for years, although this driver-based implementation allows you to super sample any game in your library. Aside from VSR, AMD has also improved frame pacing on both Dual Graphics and CrossFire systems, reducing stuttering and frame time variances. As for video features, AMD has implemented several new ones into Catalyst Omega. Fluid Motion improves interpolation during video playback to remove judder, especially while panning, although for movie playback this isn't always a desired effect. However you might want to switch on Contour Removal, which does a great job of removing compression artifacts without reducing detail. There's also 1080p Detail Enhancement, which improves the sharpness and detail of lower resolution content when played on a higher resolution display. A similar feature is available for those with 4K displays, which upscales lower resolution content while improving detail and reducing motion blur. Catalyst Omega also introduces support for a number of new pieces of hardware, including FreeSync monitors, the Alienware Graphics Amplifier, and 5K displays like the Dell UP2715k through two DisplayPort 1.2 outputs. For those Eyefinity fans out there, Catalyst Omega now supports 24 monitor arrays on systems with four GPUs. But it doesn't end there. AMD also focused on improving the driver experience by fixing a massive amount of bugs, including the top ten most reported problems such as errors during the install process, game and system crashes and black screens, and even pesky HDMI audio issues. Catalyst Omega also brings support for TressFX Hair 3.0, OpenCL 2.0 and Mantle game capture, streaming and FPS measurement through the Gaming Evolved client. To download the Catalyst Omega drivers (which we highly recommend you do), head over to AMD's driver website or our driver download section -- the drivers are available now.